In 1982, the computer electronics company, Emerson, jumped into the gaming world. They released the Arcadia 2001, a small cartridge-based system.The Arcadia 2001 controllers are similar in design to the Intellivison or Colecovision, with a numeric keypad, a joystick, and two side buttons. 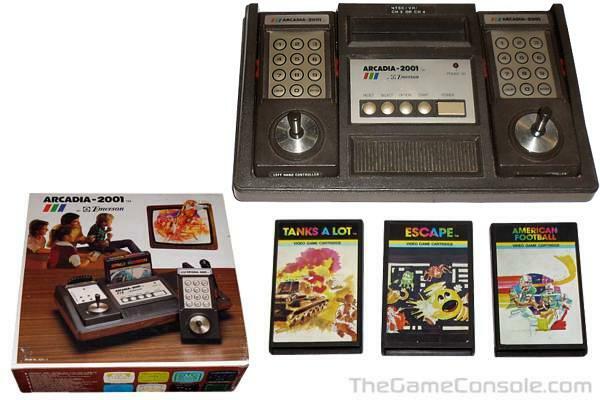 Emerson Arcadia 2001 was supposed to be the Atari 2600 killer. A great console with great games. Unfortunately they fell prey to complete lack of third party development, and the lack of Arcade game titles. Similar to other consoles before it, they were forced to release home versions of arcade games. The system didn't grasp much attention, and soon found it's way to the bargain bin at the cost of $99. The release of the Colecovision months later sealed the Arcadia's fate. The Emerson Arcadia 2001 died after only a year and a half with 35 game releases. Most never recall it existed. In 1982, a new version of the Atari 2600 console was released without woodgrain. They were nicknamed "Darth Vader" consoles due to their all-black appearance. 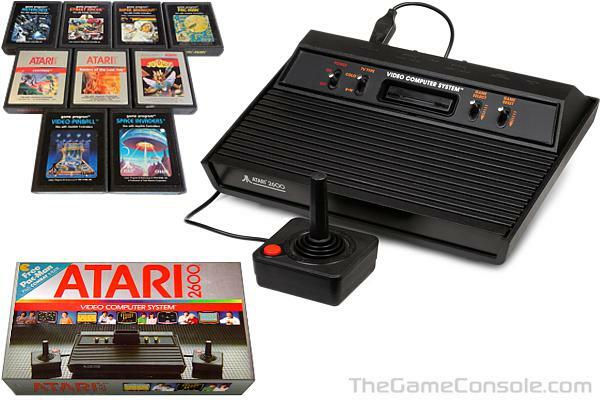 These were also the first consoles to be officially called "Atari 2600", as the Atari 5200 was released the same year. Also in 1982, Atari released E.T., a licensed game of the incredibly popular Spielberg film. The game cost around $125 million to develop, largely due to the licensing costs of the game. The game designer was Howard Scott Warshaw, who had received nothing but praise and adulation for his game Raiders of the Lost Ark. 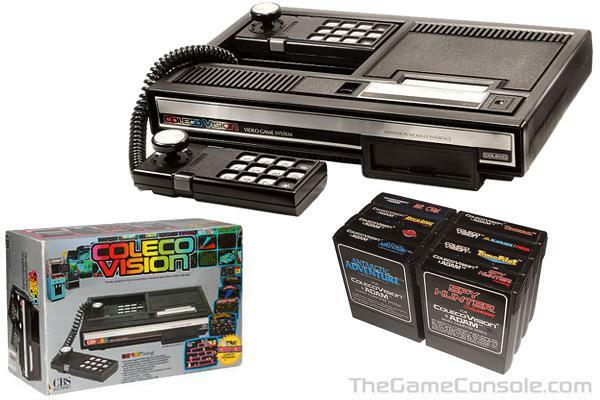 The Colecovision is Coleco's third generation video game console, released in August 1982. It offered arcade-like graphics and controllers, and an initial catalog of 12 titles, with 10 more promised titles on the way. All told, approximately 170 titles were released on plug-in cartridges during its lifetime. The controller was a flat joystick, two side buttons, and a number-pad, which allowed the user to put inserts for customized buttons. The majority of titles in its catalog were conversions from coin-operated arcade games. 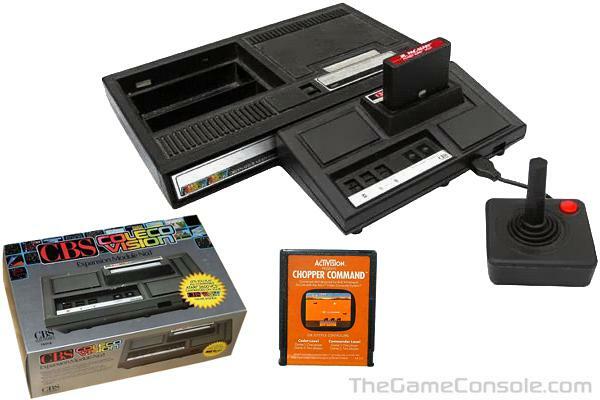 The ColecoVision introduced two new concepts to the home video game industry - the ability to expand the hardware system, and the ability to play other video game system games. By Christmas of 1982, Coleco had sold 500,000 units, mainly on the strength of its bundled games. While Atari's fortune had risen on the popularity of Space Invaders, Colecovision was the first console to feature the hit Donkey Kong, by Nintendo. The Colecovision's main competitor in the next-generation console space was the arguably more advanced but less commercially successful Atari 5200. From its introduction, Coleco had touted a hardware add-on called the Expansion Module #1 which made the ColecoVision compatible with the industry-leading Atari 2600. Functionally, this gave the ColecoVision the largest software library of any console of its day. The expansion module prompted legal action from Atari, but Atari was unable to stop sales of the module because the 2600 could be reproduced with standard parts. 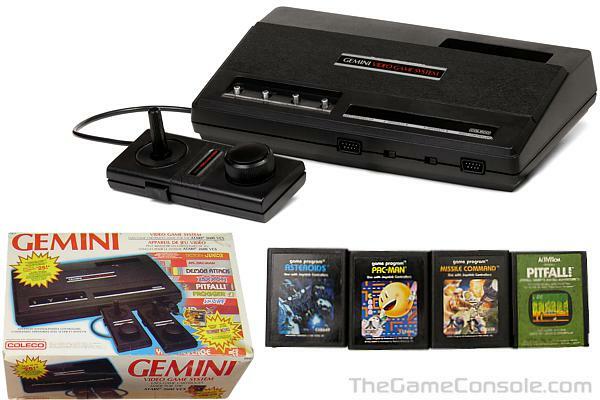 Coleco was also able to design and market the Gemini game system which was an exact clone of the 2600, but with combined joystick/paddle controllers. 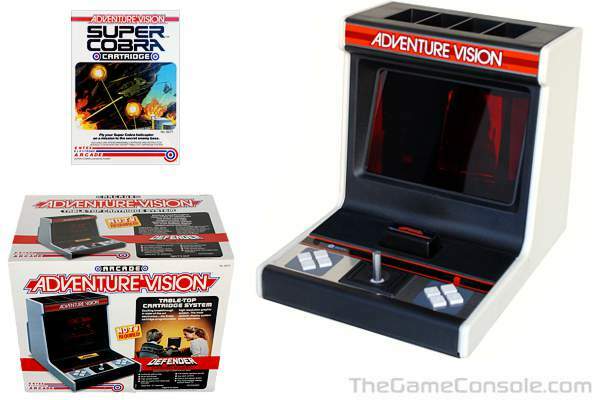 The Adventure Vision is a self-contained cartridge-based video game console released by Entex Industries in 1982. Control is through a single multi-position joystick and two sets of four buttons, one on each side of the joystick, for ease of play by both left and right handed players. One particular feature of the Adventure Vision is its "monitor." Rather than using an LCD screen or an external television set like other systems of the time, the Adventure Vision uses a single vertical line of 40 red LEDs combined with a spinning mirror inside the casing. This allows for a screen resolution of 150 x 40 pixels. Another product using this technique was produced by Nintendo in the mid 1990s � the Virtual Boy � another product which, while technically ahead of its time like the Adventure Vision, was doomed to failure in the open market. Drawbacks to the Adventure Vision are its monochrome (red) screen as well as the mirror motor, which draws a great deal of power from the batteries. The latter problem can be solved easily by the use of the built-in AC adapter port. Many casual fans dismiss the Adventure Vision as a failed handheld console. In fact, it was a tabletop console that was much too large and fragile to be used effectively for handheld purposes. The Vectrex is an 8-bit video game console developed by General Consumer Electric (GCE) and later bought by Milton Bradley Company. 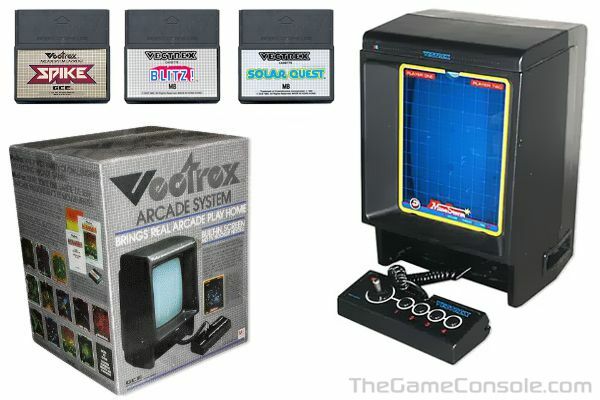 The Vectrex is unique in that it utilized vector graphics drawn on a monitor that was integrated in the console; no other console before or after the Vectrex had a comparable configuration, and no other non-portable game console had a monitor of its own (integrated). 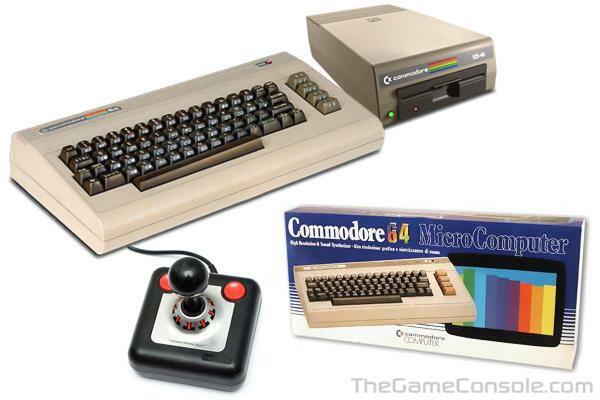 It was released in November 1982 at a retail price of $199. As the video game market declined and then crashed, the Vectrex exited the market in early 1984. Unlike other video game consoles which connected to TVs to display raster graphics, the Vectrex included its own monitor which displayed vector graphics. The monochrome Vectrex used overlays to give the illusion of color, and also to reduce the severity of flickering caused by the vector monitor. At the time many of the most popular arcade games used vector displays, and GCE was looking to set themselves apart from the pack by selling high-quality versions of games like Space Wars and Armor Attack. The system even contained a built in game, the Asteroids-like Minestorm. 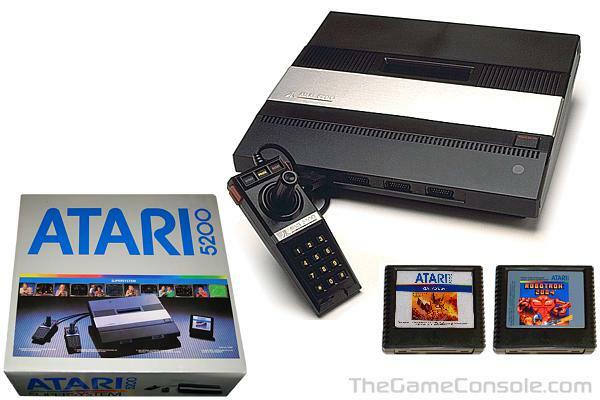 The Atari 5200 is a video game console introduced in 1982 by Atari. It was created to compete with the Mattel Intellivision, but it also competed with the Colecovision shortly after the 5200's release. In some ways, it was both technologically superior and more cost efficient than any console available at that time. The Atari 5200 was in essence an Atari 400 computer without a keyboard. This made for a powerful, proven design which Atari could quickly bring to market. The system featured many innovations like the first automatic TV switch box, allowing it to automatically switch from regular TV viewing to the game system signal when the system was activated. The initial release of the system featured four controller ports, where all other systems of the day had only two ports. The system also featured a revolutionary new controller with an analog joystick, numeric keypad, two fire buttons on both sides of the controller and game function keys for Start, Pause, and Reset. In 1982, Coleco released Expansion Module #1 for its Colecovision video game system using off-the-shelf components. Atari sued Coleco for patent infringement, however a court ruled that since Coleco used off-the-shelf components and not the same components found inside an Atari 2600, the Expansion Module #1 did not infringe on Atari's patents for the 2600. With this ruling, Coleco decided to make a stand-alone Atari 2600 clone and named it the Gemini. The main difference between the Coleco Gemini and the Atari 2600 is the controller design. The Coleco Gemini controllers featured an 8-way joystick and a 270-degree paddle on the same controller (the joystick was at the top of the controller, and the paddle was at the bottom of the controller). Unfortunately, if one wanted to play the Atari 2600 game Warlords in 4 player mode, 2 sets of Atari-made paddles were required, and one set of Atari-made paddles was required for 2 player paddle games. 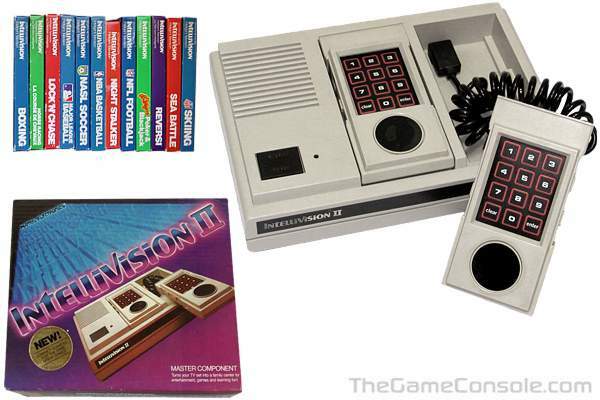 Shortly after the Intellivision I released nationwide in the United States, Mattel followed up with the new updated Intellivision II unit in 1982. The product retailed for $99.99 USD and showed a few marked improvements. In order to cut costs Mattel featured 16 position removable joysticks on their 'new' system. A LED light was implemented to show owners when the system was on or off, since this was a difficulty with the Intellivision I unit. The power button functioned also as a reset switch and must be held for 5 seconds before the power will shut off, otherwise just pressing it will reset the system. If the game was not in play the screen would go dark after five minutes in order to prevent burn in. To further reduce burn in, the Intellivision II Owner's Manual states that you should play the system using low contrast levels on your TV anyhow. To set the game on pause, you must simultaneously press 1 + 9 on the control pad. The system caused problems when running certain Coleco brand games such as Donkey Kong, Mouse Trap, and Carnival.